Picture yourself riding along quiet country lanes, slowly gliding by vineyards as sunlight illuminates the grapes hanging from the trellises. The only sounds are your bike tires on the road and the birds singing in the trees. When the afternoon sun drops lower in the sky, bathing the vines in a golden glow, you come to a small winery and coast to its tasting room. After trying a flight of locally made wines, you check into a B&B and get cleaned up. Then you step out to enjoy dinner accompanied by another wine or two produced just a few miles down the road. Here’s the best part: You don’t need to cross an ocean to experience something like this. 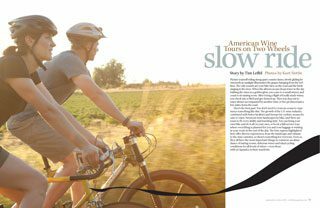 The growth of the U.S. wine industry, combined with better facilities and byways for cyclists, means it’s easy to enjoy America’s wine landscapes by bike, and there are tours to fit every ability and traveling style. You can bring your own bike and do it all on your own, or book a full-service tour where everything is planned for you and your luggage is waiting in your room at the end of the day. The four regions highlighted here offer diverse experiences, from the landscape and climate to the wine varieties, so there’s something for everyone. Even so, they all have the most important things in common: an abundance of tasting rooms, delicious wines and ideal cycling conditions for all levels of riders—even those with no Spandex in their wardrobe. In a region carved by glaciers and punctuated by a series of long, thin lakes, this wine region in New York State seems made for touring from the seat of a bike. For those who enjoy dramatic scenery and upscale lodging with their wine stops, this is the best touring area in the Northeast. The area around the 11 finger-shaped lakes of upstate New York is one of the largest wine-growing regions east of the Rockies, but you’ll often have the roads mostly to yourself. Wine country bike touring is still a well-kept secret in this area, “despite wide open country roads, rolling hills and big views,” says Bruce Stoff from the Ithaca Visitors Bureau. As you move from one valley to another, there are hills to cross, so the Finger Lakes is better for those in decent physical shape. But with tours ranging from four to 11 days, there are plenty of options for making it either easy or rigorous. Views of lakes, waterfalls and forests intersect with vineyards. Historic sightseeing stops, Victorian buildings and antique shops provide places to wander when it’s time to give your backside a break. Shorter tours generally stick to one wine region, while the longest hit several regions, cross one lake on a ferry, and ride a stretch beside the Erie Canal. Chefs in this area have decades of experience matching local wines with ingredients straight from the many farms nearby, so memorable dinners often top off days of exploring. The Finger Lakes region is perfect for people with an affinity for white wine, especially Riesling. Gewürztraminer, Cabernet Franc and Pinot Gris also do well in this cool region, and organized bike tours stop at well-known vineyards like Glenora, Fox Run and Heron Hill, as well as smaller family wineries where your group will likely get pours from one of the owners. What to Know Before You Go: Classic Adventures offers the best long guided group tours, with six-day options at around $1,900 per person. For a budget option, the annual Le Bon Ton Roulet tour set up by local YMCAs is a $520, seven-day, bring-your-own-bike affair with public camping, luggage transport and group meals. Shorter three- or four-day annual tours are available through Southern Tier Bicycle Club and WomanTours. The best times to go are between June and September. Ideal For: Physically fit riders who enjoy historic towns, sightseeing stops, fine food and upscale lodging. Missouri offers a unique opportunity to pair wine tastings with a bike trip thanks to its Katy Trail—the longest developed rail-trail in the United States. Converted from a railroad line to a well-maintained bike path, it boasts 225 miles of flat riding in the heart of Missouri wine country—perfect for casual cyclists with a penchant for wine. Before prohibition, Missouri was home to about 100 active wineries. Originally settled by German immigrants who adapted their skills to local grape varieties, Missouri, along with the Finger Lakes, supplied most of the nation’s wine in the east before everything came screeching to a halt in 1919. Today the nearly 100 wineries that have returned to the state are intersected by the dead-flat Katy Trail, with some tasting rooms right off the path in quaint towns like Augusta and Hermann. It’s an ideal set-up: bike until the afternoon, have a tasting, pedal a bit more, then check into a B&B and try some more wine in the evening after a shower. Cars rarely enter the picture on this off-road bike trail lined with bluffs along the Missouri River, making it easy to daydream blissfully about the wines you’ll be sampling later instead of worrying about the shoulder of the road. Midwest-priced inns are plentiful along this route once hiked by Lewis and Clark, and nights are spent in pedestrian-friendly towns with character. Many cyclists ride this trail for days with just a few changes of clothes and a credit card in a backpack or in panniers. With the right departure and completion towns planned out, it’s possible to bike 100 or more miles over several days and then return to the start on the Amtrak River Runner train. This area is about as unpretentious as a wine region can get, and despite little recognition outside the state, many of the wines are surprisingly good, especially the bracing whites that show off the minerals in the local soil. Aromatic Vidal Blanc, elegant oak-fermented Chardonel (a mix of Chardonnay and Sayval grapes), and the local Norton and Chambourcin red varietals are a few of the most common dry options. Some of the most delightful tasting discoveries though are the sweeter German-origin wines like Traminette and the red dessert wine Riefenstahler. The best bottles of wine rarely top $20 at retail shops. What to Know Before You Go: Independent cyclists can backtrack or return on Amtrak to one of three stations in the wine region. See BikeKatyTrail.com for specifics. The most convenient rental option is Revolution Cycles in Washington, Missouri. They’ll deliver and pick up from the trailhead nearby for a small fee. Self-guided three- or four-day Missouri wine country tours with luggage transfers are provided by Independent Tourist. The Touring Cyclist runs two annual summer tours that cover the whole 225-mile trail over eight days. At around $925 including everything but lunches, this may be the country’s best bike tour bargain. The ideal times to tour are between May and October. ideal for: Casual cyclists on a budget who are looking to get off the beaten path and try some lesser-known wines. Most organized and custom-designed California tours go four to eight days in a rough horseshoe route taking in the Napa Valley, the Sonoma Valley and the Pacific Coast. Most of the riding is on regular roads rather than dedicated bike trails, but after some traffic getting out of Napa, you’ll find yourself pedaling peacefully through giant redwoods along the Russian River and uncrowded roadways off the main highways. Healdsburg can be a great base for independent riders who want to just take loop excursions from one area, returning to their same room each night. There are close to 100 wineries within short biking distance, and the town boasts dozens of spas, boutiques and restaurants with top chefs. With dozens of B&Bs, hotels and rental cottages, this is perhaps the best spot in the U.S. for casual riders who want to just show up and bike to wineries with no pre-planning or luggage arrangements. What to Know Before You Go: More companies run bike tours here than in any of the other regions, including LifeCycle Adventures and Bicycle Adventures. Backroads runs about 25 organized tours every year. Options span a range of budgets, length and difficulty. For independent trips, Wine Country Bikes offers supported self-guided tours and bike rentals, or rent from Spoke Folk, both are in Healdsburg. California weather is good most of the year, though in the winter the vines will be bare and the nights can get cool. Riders exploring the Napa Valley will share some stretches with vehicle traffic and there are occasional hilly stretches to navigate. Ideal For: Serious foodies, wine enthusiasts and luxury inn lovers, as well as people looking for a more independent biking experience from a single base. In just a few decades, Oregon has gone from an unknown to a premier wine region, with its Pinot Noirs consistently ranking as some of the best in the world. There are now more than 400 wineries in Oregon, and though the famed Pinot Noir grape takes up most of the acreage, you can also sample excellent Pinot Gris, Chardonnay and Riesling. Most of these wineries are in the Willamette Valley extending south from near Portland to Eugene, a relatively flat area with sparse traffic. The Willamette Valley Scenic Bikeway makes up 132 miles ideal for cyclists. Despite the explosion in popularity of Oregon wines, this region is not nearly as crowded as California’s Napa Valley. Here, you often have the roads and the tasting rooms to yourself. The bike routes are on regular roads, but it’s possible to do much of the touring on calm country lanes, with most of the hills confined to winery building approaches—the payoff being a panoramic view. You can spend days spent meandering down rural country lanes lined with grapevines, orchards and hop fields, before easing into afternoon wine tastings. In the summer it’s not hard to find a healthy snack for the ride from the many roadside stands selling berries and fruit. Nights are in laid-back, welcoming towns like Dundee, Newburg, McMinnville and Carlton—population 1,790. These are small towns with character, with boutiques next to feed stores on main streets made for walking. Bistros serve organic produce and locally farmed meats with wine by the glass. B&Bs and small hotels are the primary lodging choices, ranging from designer suites to rooms in renovated grain silos. You can base yourself in one inn and branch out from there, or meander down the valley to sleep in a new area each night. A few short routes allow riding back on an Amtrak train: The connections between Salem, Albany and Eugene are 30 to 44 miles. Perhaps the best way to get a taste of an Oregon wine biking trip in one day is to follow the tracks of Tom Huggins at Eola Hills Wine Cellars in Rickreall. Each Sunday in August he leads a group on two intersecting routes of 30 or 52 miles (your choice, based on ability), stopping at others’ wineries along the way and finishing up with a barbeque at Eola Hills. What to Know Before You Go: Bicycle Adventures and LifeCycle Adventures run customized independent tours while Unusual Tours is a budget option for those with their own bike who are up for camping and motels. Cycling routes and maps are at Ride Oregon. For train connections, see the Amtrak Cascades and Coast Starlight routes at Amtrak.com and reserve far ahead for a bike spot. The Eola Hills one-day rides with support are $65. Or try Pedal Bike Tours’ one-day excursions with a van to take you up the hills to the wineries. For the best weather, cycle Oregon between April and November. ideal for: Pinot Noir enthusiasts who enjoy farmland country lanes, small towns and local inns with character. One of the most refreshing classics.